Add relaxing in the cozy CorLiving Oakland collection to your exciting summer plans. The PPO-801-M Middle Seat with deep back matches the design of the rest of the PPO-801 set so you can make the configuration you need. 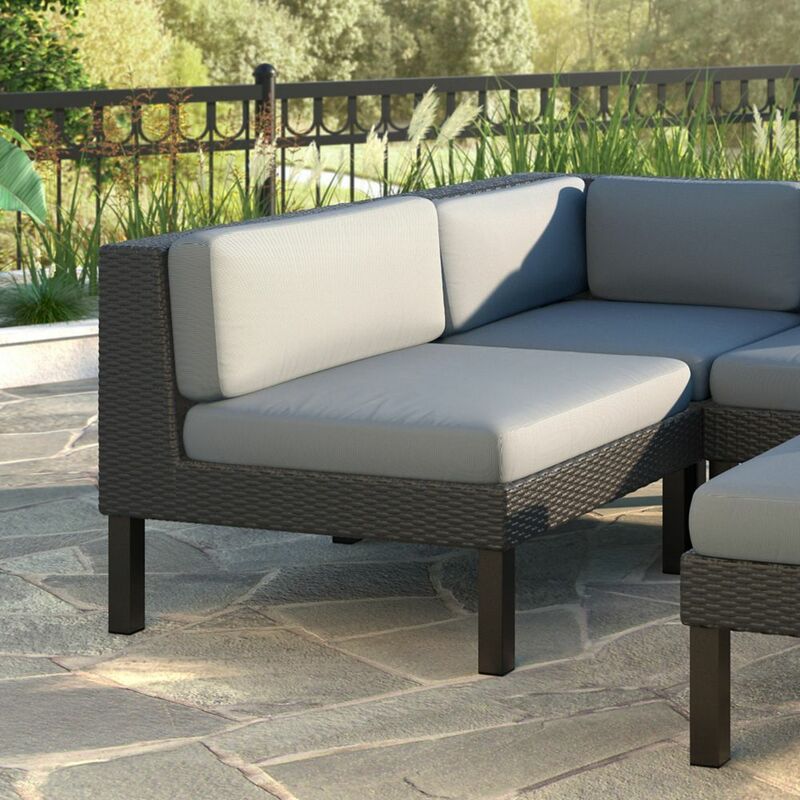 The Textured Black resin rattan weave is complimented by high quality, weather resistant foam seat cushions wrapped in washable Dove Grey woven seat covers. Just add the legs, and the PPO-801-M is ready to use upon delivery. Its easy to complete your summer with a comfortable Oakland patio set from CorLiving. The PEX-864-Z 3pc outdoor chair and side table set from CorLiving welcomes back the days of Mission design, which was popularized in the Southwest during the early 20th century. The contemporary approach to this classic aesthetic is what sets this stylish armchair and table set apart. From the clean lines to the emphasis on showcasing the wood grain. The durable wooden frames have been treated to withstand the elements while the black cushions offer a comfortable seat to enjoy cold drinks on a hot summer day. The PEX-868-Z 4pc outdoor chair and coffee table set from CorLiving welcomes back the days of Mission design, popularized in the Southwest during the early 20th century. The contemporary approach to this classic aesthetic is what sets this outdoor set apart. From the clean lines to the emphasis on showcasing the wood grain. The durable wooden frames have been treated to withstand the elements while the black cushions offer a comfortable seat to enjoy cold drinks on a hot summer day. Extend your homes living space in your own backyard with this inviting 7pc patio dining set from the Park Terrace Collection. This set assembles in minutes creating an elegant setting. Durable steel frames, UV resistant resin wicker, 2 Captain's chairs, including foam cushions with zippered washable polyester seat covers in Sunset Yellow, black glass and 4 space saving Parson shaped chairs give the touches that make a statement while simple lines, complete the transitional design. Featured in a Charcoal Black Rope Weave and accented with a glass table top this 7 piece set is a great way to outfit your outdoor deck space. Oakland Patio Middle Seat in Textured Black Weave Add relaxing in the cozy CorLiving Oakland collection to your exciting summer plans. The PPO-801-M Middle Seat with deep back matches the design of the rest of the PPO-801 set so you can make the configuration you need. The Textured Black resin rattan weave is complimented by high quality, weather resistant foam seat cushions wrapped in washable Dove Grey woven seat covers. Just add the legs, and the PPO-801-M is ready to use upon delivery. Its easy to complete your summer with a comfortable Oakland patio set from CorLiving.